TaylorMade makes some of the best performing clubs in the market, and the JetSpeed model is one of their most successful. The JetSpeed Golf Rescue hybrid uses various and modern technologies to ensure that golfers always get long distances and to improves their overall performance. TaylorMade makes some of the best performing hybrid clubs in the market, and the JetSpeed model is one of their most successful. The JetSpeed Golf Rescue hybrid uses various and modern technologies to ensure that golfers always get long distances and to improves their overall performance. These features include a New Speed Pocket that is more efficient than what is in their previous clubs. Also, the club features a low-forward center of gravity that works with the speed pocket to provide long distances and enhance playability. 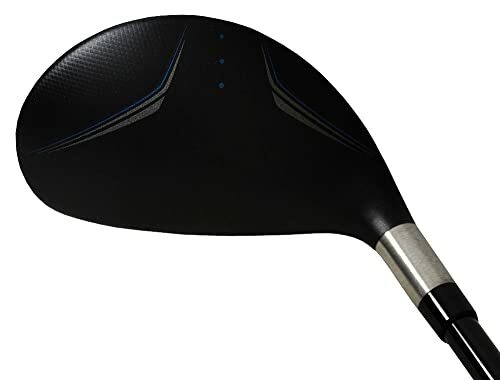 Other features include a low-profile head, a Matrix Velox T shaft and a matte black finish with some appealing graphics. New Speed Pocket: TaylorMade gives this hybrid a new speed pocket that is more efficient than before. This speed pocket works with the lower and forward center of gravity to promote long distance and enhance playability. Low-Profile Head: The low-profile head design that also features a shallow face will offer golfers an easy and high launch for greater playability. This low-profile makes it easy for golfers to hit the ball below the equator and hence launch it higher. Shaft: For the shaft, TaylorMade uses a Matrix Velox T graphite shaft that promotes maximum feel and improves control for all swing speeds. This Matrix Velox T shaft is available in regular, stiff and senior flexes. Look and Feel: The JetSpeed Golf Rescue comes in a typical hybrid shape, and it features a matte black finish with some blue graphics. This finish gives it an appealing look while also minimizing the glare. For the feel, most golfers will find it a no-nonsense club that feels very stable, and it feels more stout than explosive. The efficient speed pocket design increases ball speed so that you always get long distances. It has a 'hot' feel throughout the face. The low-profile head makes it easy to launch the ball on a high and long carrying flight. TaylorMade uses a Matrix Velox T graphite shaft to enhance the feel and control for all swing speeds. It is a capable hybrid that is playable from mild rough, bunkers and hardpan with a lot of ease. This club is consistent from different lies and with little backspin or sidespin. The matte black look with blue graphics gives the hybrid an appealing look and reduces glare. The light feel may reduce control for some golfers. It does not cut through thick lies easily. This hybrid is not adjustable. All the clubs in the JetSpeed model by TaylorMade come with an ultra-strong steel alloy face for maximum speed. And so with this hybrid, you can be confident of always getting maximum ball speeds and hence long distances. Apart from the steel face this hybrid also has a low-profile head that will launch the shots higher than its predecessors and most others in the market. And so you can always be confident of an impressive performance from the bunkers and mild roughs when swinging this club. 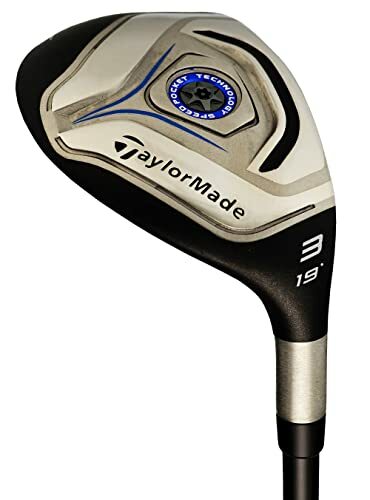 Even with the few drawbacks such as the lack of adjustability and its inability to cut through thick lies quickly, this is still one of the best hybrid golf clubs out there.